A woman carries her jeans mannequin through Bobae Market in Bangkok. Where do you go when you need a gross (144 pairs) of jeans in a hurry? Or a case of mixed graphic tee shirts? Or a shipping container of men's underwear? That's easy. You go to Bobae Market, a rabbit warren of clothing shops in "old" Bangkok, off of Krung Kasem Road. In a city that has a market for everything, Bobae is the market for clothes. Provided, of course, you're a wholesale buyer looking to ship to Russia, South Korea or Uganda. Or most anywhere else in the world. I've been reading about Bobae Market for years. It shows up in a lot of tourist guides and it's a landmark for central Bangkok. But I never had much interest in going there. It's a clothing market. How interesting could it be? It turns out, I shouldn't have been so dismissive. It turns out, Bobae is really interesting. It turns out, I've been twice in two weeks and I can easily see myself going back again. I "discovered" Bobae during an early morning taxi ride to Sanam Luang. Bangkok traffic is light at 5.30AM so my cabbie took surface streets rather than tollways and we cut through Bobae on our way to Sanam Luang. Even through the window of the passing taxi I could see that this was a place worth coming back to. 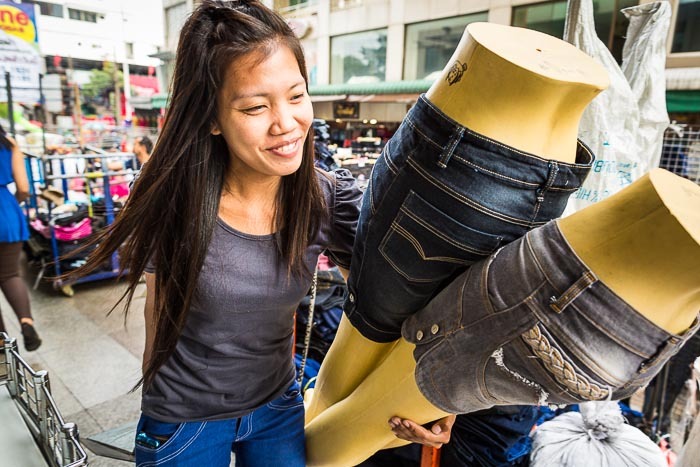 Imagine scenes of New York's "Fashion District" cut with a Bangkok market. I bookmarked the location on my iPhone's Maps app and promised myself to return as soon as I could. I've been back to Bobae a couple of times since. The place is huge. 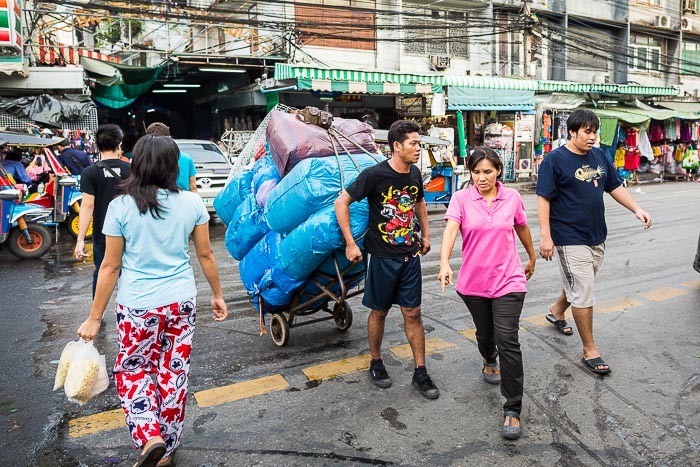 It sprawls across blocks and blocks of Bangkok. Krung Kasem Road, just west of the railroad tracks that come out of Hua Lamphong train station, is more or less the heart of the market but its tentacles spread out from Krung Kasem leading you on an adventure with every turn. The sois (alleys) off of Krung Kasem are mostly covered, so once you're off the main road, you're into a world as dark and mysterious as any Middle Eastern souk or Latin American mercado. The good news is that even if it's pouring (we're into the rainy season in Bangkok) you're not going to get too wet. The bad news is that even at 9AM, it's as dark in the market as it as 5.30AM. This is a place where you're going to enjoy the high ISO capabilities of modern digital SLR cameras. You can of course try to shop in Bobae. This is Bangkok after all and shopping is practically an art form here. But don't be too surprised if you leave empty handed. Almost all of the merchants are looking to make big sales. Buying 144 pairs of jeans is no problem. Buying one pair might be. There are more photos of Bobae Market in my archive.